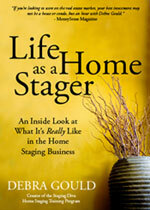 Aspiring Home Stagers, Have You Lost Touch With What You Love To Do? If you read any books about how to find your life purpose, they always recommend looking back over your life for clues about where your real talents are. I’ve been addicted to decorating since I was a kid and discovered most home stagers have been too! As adults we often lose touch with what we loved and what we were naturally good at all those years ago. After I shared some of my early memories of creating Barbie furniture out of cut up Kleenex boxes and painting murals on my bedroom walls, others jumped in with their own reminiscences. I hope you enjoy these and that they help you reconnect with that part of you who was born to decorate. Donna Dazzo, who took my program 5 years ago and is the toast of New York home stagers, shared that she was recently going through her grammar school diary and found floor plans she had drawn as a kid complete with neatly labeled furniture. Danielle of Creative Solutions shared that when she was a teen she convinced her mother to redecorate the living room according to her vision and repeatedly created “little scenes of drama” all over her home with paint and lighting. Stacy Goade, Alaska’s first Staging Diva Grad, shared how she convinced her mom to order her a canopy bed out of a Sears catalog and completely redesigned her bedroom to create the “right energy and felt like a goddess” in her new space. Staging Diva Grad Susan Atwell got both her parents in on the act, with Dad building furniture and Mom sewing window treatments. Later, she decorated her college dorms, which always felt like home. Today she’s in her 3rd year as a stager, with a day job in IT. > I’d love for you to share your own memories with our community. You can read my original article and see other’s comments at Addicted to Decorating or Born To Be a Home Stager.